I know a lot of people in my area who simply label all the flyers and free local deal magazines as junk mail and toss them in their recycling box without even a glance. If you do this as well, I caution you to take another look. I find all sorts of great coupons in the free flyers and deal magazines that come in our mail, including coupons for Aldis, Bath and Body Works, Kohls, JC Penny, and a tonne for local restaurants, mom and pop owned stores, and even coupons for oil changes and tire rotations at our favorite repair shop. In just trip to the mail box, I found $8 worth of coupons my family will use at local restaurants to make our small eating out budget stretch further.Over the course of a year that is almost $100 in savings. 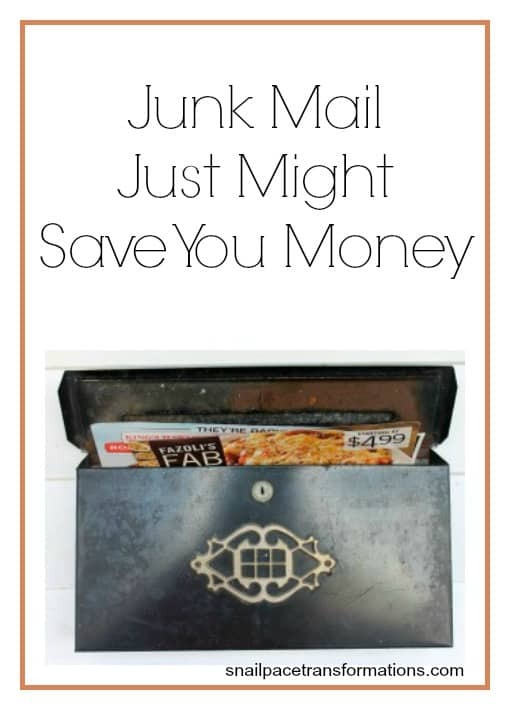 So approach these magazines and jumbles of advertisements at a snail pace and make sure you are not throwing valuable saving opportunities away. Looking for money saving tips? Follow my Saving Money Tips board on Pinterest. Yes, it can be worth it, but occasionally I look at my ‘hourly wage’ and find it’s not worth it if it’s taking time away from other important things. Annie Kate, stopping by from Frugal Friday and procrastinating on my Fit Mommy Friday post….sigh! We get something like that, too, and it really does pay to look through them! We recently went out for my birthday to a Japanese restaurant, and saved $20! I just picked up the phone book for the first time in YEARS yesterday…what has the age of 411 done to us? Great tip. I never would have given it a second thought.